How to Treat Flea Bites on your Pets? Flea bites should be treated as soon as possible because the further it takes to treatment, the more the threat they pose. Fleas often start breeding on their host skin and must be removed by your veterinarian which will prevent any infection on your Pet. When your vet’s work is done, then you will have to take care of your pet. Thorough skin cleaning is required at the bite site so as to lessen the chance of any infection. An immediate action which you can take before you take your cat or dog to a veterinarian is to clean their skin with alcohol or another antiseptic. Flea Bites on CatsFlea Bites on DogYour dog may also benefit from an antihistamine cream to soothe his itchy skin, and pain relievers may help him feel better. It may take a week or more for the itchiness to completely leave your dog’s skin, even with treatment. Following is the list of Sprays and medicines which can be helpful in the treatment and prevention of flea bites. Frontline- It is available as sprays, drops and medicine. It’s highly effective and is used on a large scale. It is easily available at your local Chemist. The advantage is a medicinal cream which is directly applied to the skin. It’s a fast action medicine. K9 Advantix is one of the most commonly used insect killers as it is not only effective on fleas, but also on biting mosquitoes, flies and lice. Capstar is an oral pill only for dogs that kills 98% of the adult fleas. Eggs and larvae which might be breeding under the skin don’t die. Revolution is a named medicine available mostly in drop form. It protects dogs against heartworm, fleas and various other parasitic infections. Program- It’s a flea treatment product and it’s one of the most popular products used to fight fleas. It is available in pill or liquid form and the cat must eat it every month together with a meal. It kills all the fleas by targeting their reproductive system. Biospot is a broad-based solution which is also economical. It kills fleas, ticks, and mosquitoes. 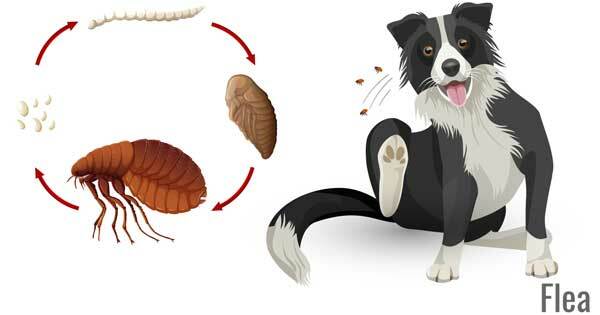 The effect of treatment lasts for about 3 months against fleas and only 1 month against ticks and mosquitoes. It’s not water resistant. Choosing an appropriate treatment for your Cat or Dog is very important and it should be done only with the consultation of your Vet. Only the medicines advised by your vet should be consumed. Overdosage of these medicines can also be deadly.